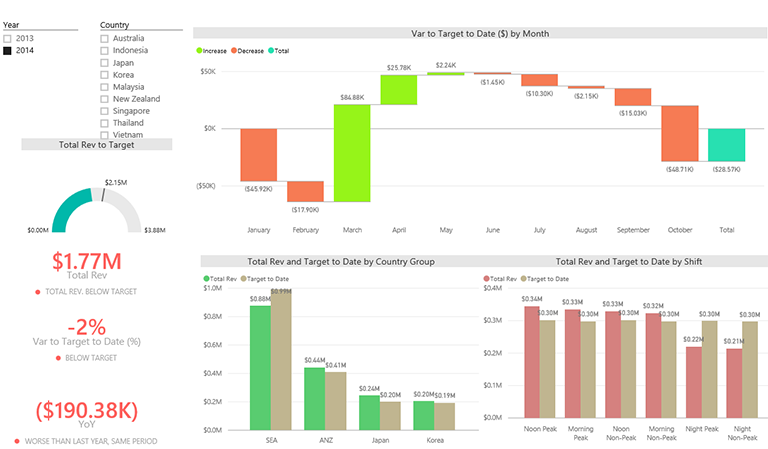 The solutions looks at helping clients manage their revenue performance by comparing their actual revenue against set targets. The Performance Status view is meant for financial managers whose main focus is centered on the revenue of the business. 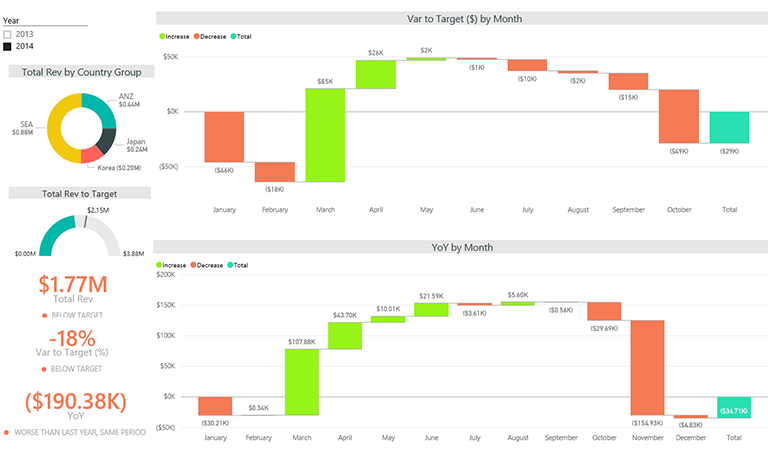 The KPI Cards located at the top of the page are a clear comparison of current revenue performance against target and previous year’s performance. Numbers for Period Performance against Target appearing red show they are below the target. Conversely, if it appears green, current performance is above the target. There are three different charts for performance breakdown by the three different dimensions (country, shift and product). The charts shown are based on the revenue against the dimension. All of them can be further drilled down to get a more in-depth view of each dimension. Here’s an explanation of what the colour represents for the bullet charts. The Performance Map View consist of a heat map chart which enables the users to identify key areas of the business which are performing/underperforming across different periods of time. 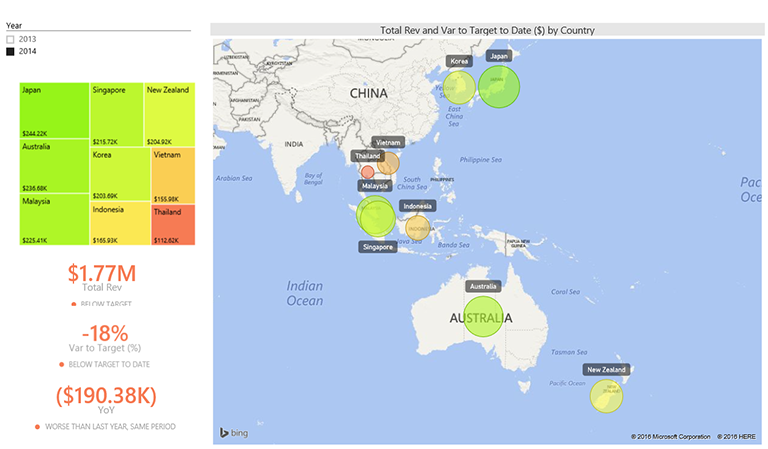 To better understand the respective grids of the heat map, the User can hover over each grid and it will automatically display the exact figures and amount. - Red represent Negative Values. 1. Variance to target indicates the difference between the actual revenue generated for the current month to that of the targeted revenue. 2. Year on year indicates the revenue generated this year compared to that of last year. The KPIs view enables users to measure the difference between the targeted value and actuals. This allows the users to identify areas they should improve and focus on to maintain or improve their performance. The KPIs are Number of Transactions, Units Per Transaction and Revenue Per Transaction. They are denoted by the three quadrants with Region as the dimension. All of them can be further drilled down to get a more in-depth view of each Country. We can mouse over to see the exact figures and amount as well. The Growth-Share view is where the growth share matrix is shown. It helps businesses to allocate resources more efficiently and it is also often used as an analytical tool in brand marketing, product management, strategic management and portfolio analysis. The growth share matrix includes namely the Cash Cow, Dog, Question Mark and Star. Cash Cow: The business has a high market share in a slow growing industry. Dog: The business has a low market share in a mature and slow growing industry. Question Mark: The business has a low market share but high market growth. Star: The business has a high market share in a fast-growing industry. The growth share matrix will help the business identify which areas they are lacking or are stronger at, and it helps to further improve and enhance their business allocation of resources. In this view, it shows the revenue share trend line and the growth share matrixes which are based on the different dimensions. They are by Country, Shifts and Products. Each panel shows the revenue share against revenue growth. Note that the revenue growth and share calculation for the growth share matrix is based on the year on year growth on the total amount. In addition, there’s a play button at the bottom left of each chart. By clicking on the play button, it will show how the data points move across time (by month).